Small, lightweight design provides greater portability and conserves space when connecting multiple devices. 1.Only one hub is included, power adapters, SD memory card, cables or other accessories are not included. 2.The USB-A ports of this product support Max. 5V 900mAh total charging output. 3.For stable connection, connect a power adapter to the hub when using high-power devices. The hub can only support ONE hard driver when no power source is connected to the hub. 4.The USB-C female port of this product is only for charging USB-C laptops whose USB-C port supports USB Power Delivery (PD). 5.A 4K-capable display and a 4K-capable HDMl cable are required to achieve 3840x2160 resolution. Tips: For best performance, devices connected to this hub should not exceed total current of 900mA maximum when no power source is connected to the hub. Otherwise, output current may become unstable or disconnected. More Ports, More Practical Type C Adapter : USB C Hub with charging port, 4K HDMI port, 3 x USB 3.0 ports, and SD ard reader. Satisfy life and work. This usb c hub pefect matches Macbook pro，Google Chromebook or other Type-C devices. Type C Adapter with Advanced chipset : Advanced chipset with good thermal design, will not heat even if used for long time. 2.5D unibody aluminum alloy ionized finish, reinforced TPE cable coating,EMI protection prevents interference with wireless devices. Hub with Power Delivery: BYEASY USB C Adapter charges your MacBook Pro or other Type-C devices while connecting multiple peripherals or transferring data. Type C to 4K HDMI Adapter: Mirror or extend your screen with the USB C adapter's HDMI port and directly stream 4K UHD or Full HD 1080p video to HDTV, monitors, or projectors. 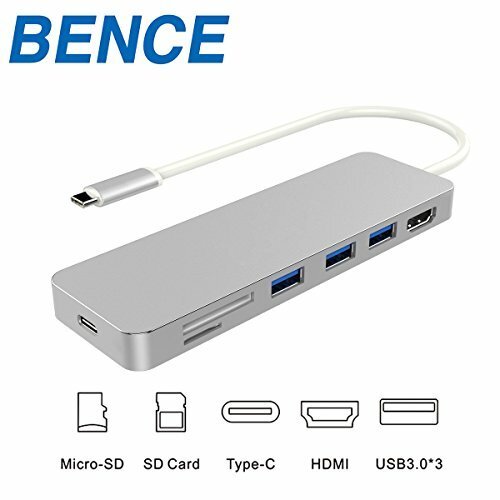 Package Contents: BENCE Type C to USB Hub with HDMI, PD Port, Card Reader and Three USB 3.0 Ports, User Manual, 30-Day Money Back Guarantee. If you have any questions about this product by BENCE, contact us by completing and submitting the form below. If you are looking for a specif part number, please include it with your message.